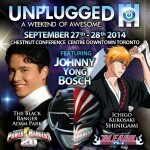 To all of our friends and fans up north – during the weekend of September 27th, 28th in Toronto you will have a chance to meet veteran Power Ranger and anime voice actor Johnny Yong Bosch. He will be appearing at Unplugged Expo, which will be held that weekend of September at the Chestnut Conference Centre in downtown Toronto. 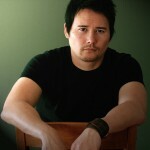 Just in case you’re not familiar with Johnny Yong Bosch – he played “Adam Park” the second Black Ranger from Mighty Morphin Power Rangers, as well as the Green Ranger for both Power Rangers Zeo and Power Rangers Turbo. As for his anime credentials? He’s best known for his roles on Trigun, Bleach, Naruto, as well as video game voice over work on Saints Row IV, Persona 4, Soulcalibur V, Transformers: War For Cybertron, and Marvel Vs. Capcom 3. To stay up to date with Unplugged Expo, check out their official website at UnpluggedExpo.com and follow them on Twitter @UnpluggedExpo! The fans of TokuNation voted very heavily in favor of this character and actor as their 2nd Best Power Ranger of All Time, and that honor goes to the very-talented and very-popular Johnny Yong Bosch, who played the role of Adam Park, the second Black Ranger in Mighty Morphin Power Rangers, as well as the Green Ranger in both Power Rangers Zeo and Power Rangers Turbo. Adam Park’s life forever changed the day he went rollerblading with his buddies Rocky and Aisha, as they ran in to Tommy, Kimberly, and Billy. Originally from the rival school Stone Canyon, he transferred to Angel Grove and in the process ended up being kidnapped by the evil Goldar. Discovering the hard way that you can’t wrestle snakes, Billy was forced to remove his helmet, leaving Adam as one of the only people to know the true identities of the Power Rangers. Eventually, a peace conference would occur and three Rangers would leave, and thus, Adam was selected to become the new Black Ranger of the Mighty Morphin Power Rangers. 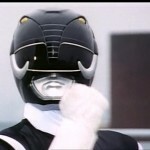 The character of Adam would go through a few different things – overcoming self-doubt and gaining self-confidence, being duped by Scorpina, developing a mild romance with fellow Zeo Ranger Yellow, Tanya, and would actually have two of his most memorable moments in the show (prior to his 15th Anniversary return) helping instill self confidence in to others. Adam would eventually become a second-in-command to Tommy during Power Rangers Zeo (until Jason returned), and continue in that role briefly in Power Rangers Turbo. Adam would return in Power Rangers In Space, specifically the episode Always a Chance, where he would help the In Space Black Ranger, Carlos, to overcome his lack of self-confidence after he accidentally injured a fellow Ranger. 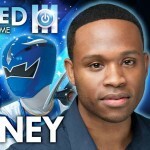 He would morph back in to the Mighty Morphin Black Ranger, using the damaged (but not destroyed) Mastadon Power Coin, and would eventually have the powers give out entirely during the fight. He would return again for the 15th Anniversary two-parter during Power Rangers Operation Overdrive titled Once A Ranger, where the son of Lord Zedd and Rita Repulsa, a villain named Thrax, would severely damage the Operation Overdrive Rangers’ connection to the morphing grid, causing the Sentinel Knight to grab Adam, as well as other previous Power Rangers, and restore their power, creating a new team of Power Rangers. Adam would restore Alpha 6 from a storage unit and take him back to his dojo in Angel Grove. Adam Park was played by the masterful Johnny Yong Bosch. Where Mighty Morphin Power Rangers launched his acting career, Johnny’s role as Vash the Stampede in the anime series Trigun would launch his anime career. He has had voicing roles in over 60 different anime movies and series, ranging from Akira to Gurren Lagann to even Pokemon. 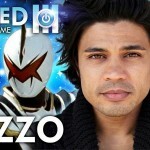 He’s also voiced some characters in video games, from Bumblebee to Zero to Nero. He continues to star in various films, teaming up with former Power Rangers director Koichi Sakamoto, and continues to do a majority of his own stunts. If that wasn’t enough to impress you, Johnny is also the lead singer in his own band titled Eyeshine, who continue to grow in popularity to this day. One can easily make the argument that Johnny Yong Bosch has gone on to have one of the most, if not THE most, impressive careers after Power Rangers. And you would agree, as you’ve voted him the 2nd Best Power Ranger of All Time. So who will be number one? Pretty sure if you’re a Power Rangers fan you can figure this one out. If you’re not, you’ll still want to check back tomorrow when we announce the individual that TokuNation users have voted as the #1 Best Power Ranger of All Time. See you on New Year’s Eve!